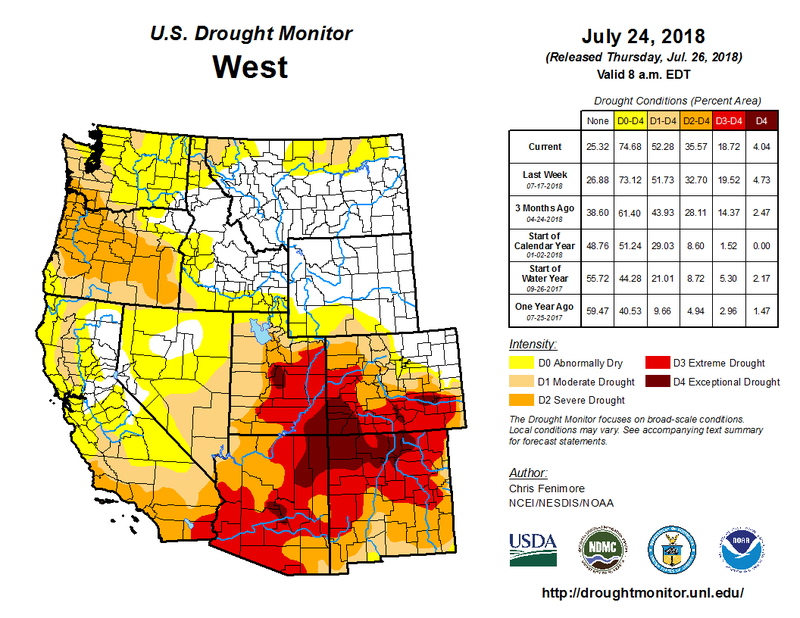 West Drought Monitor July 24, 2018. Nathan Elder, manager of raw water supply for Denver Water, said low water levels at the South Platte reservoir in Littleton created a need for a big draw from Dillon. Even though human consumption is Denver Water’s primary use, Elder said they do keep the marinas in mind. The U.S. Drought Monitor, which tracks drought across the country and assigns drought severity based on conditions, assigns dryness levels from D0 to D4. D0 is considered “abnormally dry” but not severe enough to be considered a drought, while D4 is considered an “exceptional drought” that means there is a serious water emergency that causes “exceptional and widespread” crop and pasture losses. Summit County’s “severe drought” is at level D2. At that stage, crop and pasture losses are likely, water shortages are common and water restrictions are imposed. Victor Lee is a hydrologist and civil engineer for the Bureau of Reclamation, which manages the Green Mountain Reservoir in Heeney. Lee said that the monsoon is kicking in late due to less-than-ideal weather patterns. Combined with an early spring, that makes for a long period without significant precipitation. Lee said that there is no threat to water supplies for human consumption, yet. A few years of healthy precipitation has meant that reservoirs across the state have managed to keep healthy levels in reserve and have been steadily releasing water to keep rivers and streams flowing. “Without the reservoirs in the system, the stream flows we would be seeing throughout the upper Colorado would be much more dire,” Lee said. If this drought persists into yet another year, the reasons for worry will multiply and tough decisions will be made. 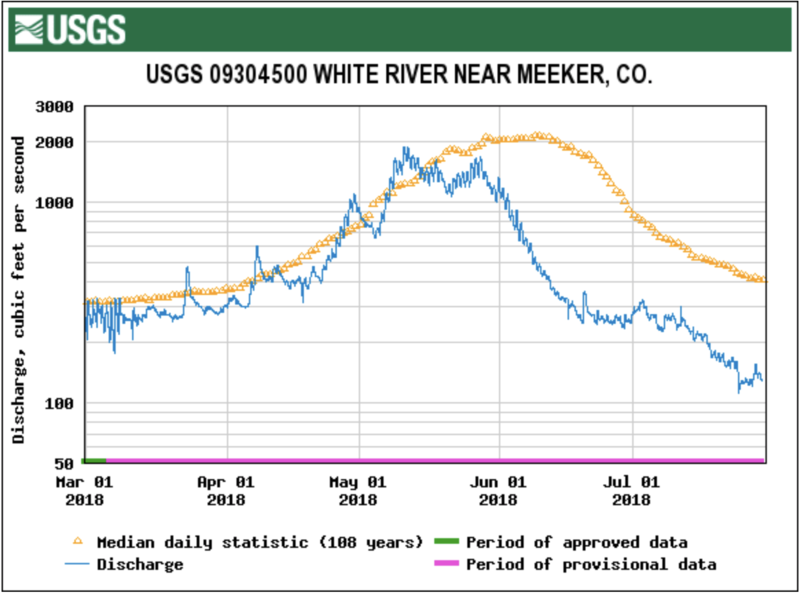 Due to the low flows, dry conditions and extreme heat, higher water temperatures in the White River are nearing danger levels for cold-water fish. CPW officials have been encouraging anglers to fish in the early morning, when water temperatures are cooler and less stressful to fish. Last Friday, CPW, out of Grand Junction, asked for voluntary fishing closures on western Colorado rivers due to the high water temperatures and low flows. 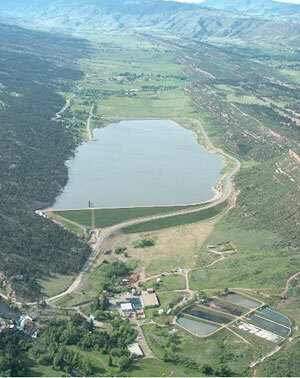 CPW and the Colorado Water Conservation Board (CWCB) entered into a water lease agreement in 2012. The agreement allows the partial release of CPW’s water stored in Lake Avery to help meet minimum instream flow needs of 200 cubic feet per second (cfs) at the County Road 4 (Wakara) bridge. Users at Lake Avery would see declining water levels in the lake whenever any releases are initiated. deVergie said CPW would give at least 48 hours notice prior to any releases. In 2012, the lake level at Avery dropped about six feet as 1300 acre-feet out of the 7600 acre-foot storage capacity reservoir was used. Water released comes from the bottom of the reservoir, is relatively cold, and able to be quickly oxygenated. Releases this year could use twice as many acre-feet from the reservoir and drop the lake level up to 14 feet. River advocates attending included Shawn Welder, Bob Dorsett of Colorado River Watch, Roy Wedding and Bob Regulski. Upriver fishing ranch interests were noticeably absent from the meeting. One such individual told the Herald Times after the meeting that neither he nor his manager had heard anything about the meeting beforehand. Graf told the meeting that his agency is evaluating how their water rights statewide might be better used to improve difficult situations like the White River now faces which might differ, to varying degrees, from the related water right decrees. Dorsett cautioned the group not to think of this as an unusual circumstance, that current data trends are for these low flows to be more the norm. This concern evoked some discussion about needing more water storage in the valley, which could possibly include enlarging Lake Avery. Johnson, a Miller Ditch irrigator, wondered why we were trying to save fish and habitat in the White River when there is so little public access to the river for fishing, to which de Vergie responded that the duty of CPW was to provide a viable fishery and to serve all members of the public, including those that avail themselves of fishing on the private ranches. Lake Avery releases of 10 to 15 cfs in 2012 didn’t occur until Aug. 30 and continued until Oct. 3. That year, de Vergie said, we experienced some good rain in July that postponed the need to release Avery water until late August. The threshold factors CPW said are critical for the fish are a flow of less than 200 cfs at the Wakara bridge, water temperatures above 70 degree Fahrenheit there, and dissolved oxygen levels of less than 5 ppm. These are the factors that will trigger releases. Southwest Colorado and some of the higher elevations in the region have seen increased moisture recently that has allowed for lifting of fire restrictions, including by the Grand Mesa, Uncompahgre and Gunnison national forests, the Bureau of Land Management’s Montrose-based Uncompahgre Field Office, and Montrose County, all on Friday. But the picture has been different, as in drier, in the Grand Valley. Through Friday, Grand Junction was experiencing its driest July in a decade, with just 0.08 inches for the month, according to National Weather Service data. It hasn’t been drier since just 0.02 inches fell during all of July 2008. Charnick said that by this time in an average July Grand Junction has received about a half-inch of rain for the month. A clockwise circulation forms around that high pressure, so what’s needed is for the high pressure to move a bit east so moisture from the south is brought up into the area, he said. Still, Charnick said the area isn’t necessarily running behind in getting monsoonal rains. He noted that average precipitation in August in Grand Junction is 0.95 inches, compared to 0.61 inches in July. The monsoon can extend into September. “Actually September is usually our wettest month of the year,” Charnick said, averaging 1.19 inches. Peter Goble, climatologist and drought specialist at Colorado State University’s Colorado Climate Center, said Grand Junction is heading into its wettest time of year. He said that’s all relative, given that a month with 1.19 inches of precipitation would be considered a dry month in a lot of places. Still, any time an area is heading into its wettest season climatologically, it brings hope of getting precipitation to reduce moisture deficits, Goble said. On the down side, Goble said if an area misses out on getting much moisture during what is supposed to be its wettest time of year, it can be stuck with a deficit for quite a while. He said the Grand Junction area’s monsoon season typically peaks later than for a lot of the state, in late August or early September, but it’s still a bit disconcerting that it hasn’t started yet. Essentially all of Mesa County is now in the extreme drought category — the second-worst category. Charnick said that reclassification occurred in early July. A tiny sliver of the far southern part of the county is in the exceptional category, which is the driest. Much of the Four Corners area also is in exceptional drought. Goble said the last time the entire county was in extreme drought was the summer of 2012. He said the county got out of the extreme drought category by the middle of the snow season in 2013. The county reached the exceptional drought category in the summer of 2002. Joe Burtard, spokesman for the Ute Water Conservancy District, one of the Grand Valley’s major water providers, said the current drought is one of the worst on record for his agency, one of four major episodes that also include the 2002 and 2012 droughts and one in 1977. “This year has been a really abnormal year for us in all aspects,” he said. He said it’s when the area moves into the extreme and exceptional drought categories that area water providers start seriously considering mandatory water restrictions, rather than the voluntary ones now in place. “We’re really waiting to see what these monsoon rains do for the valley,” he said. Ironically, though, those rains are expected to pose a challenge to local water providers rather than just simply benefits. The Lake Christine Fire near Basalt has charred more than 12,000 acres, and the rains are expected to bring flooding that will result in ash reaching local rivers, and ultimately the Colorado River. Burtard said that will affect the Clifton Water District, which gets water out of the river. As a result it will impact Ute Water, which would serve as a backup water source for Clifton Water as part of an agreement among local providers to help each other in emergency situations. That will further tax Ute Water, which already has been pulling from limited resources this summer, Burtard said. “It’s not a matter of if, it’s a matter of when, because when we get that monsoon rain that ash is coming our way,” he said. Ute Water also recently purchased water rights from the Ruedi Reservoir in the Fryingpan River Valley above Basalt to help in drought years and in planning for population growth in its service area. That water also could help in a situation such as a fire on Grand Mesa that could impact watersheds serving Ute Water. But for Ute Water to tap the Ruedi supply for any reason, the water would have to run through Basalt and down the Roaring Fork and Colorado rivers. By 2042, the city of Loveland is projected to demand 30,000 acre-feet of water a year, according to projections calculated by Loveland Water and Power staff. Comparatively, the city currently needs about 18,000 acre-feet annually, and the city’s diverse portfolio of water sources yields a firm 22,400 acre-feet each year. One acre-foot is enough water to cover one acre of land, one foot deep. It’s about enough water to supply two homes for a year, said Larry Howard, a senior civil engineer in the city of Loveland’s water resources division. Meanwhile, both the city’s population and acreage is growing. Loveland’s 2017 data and assumptions report states the city now has a population of 74,385 within a 35 square mile area, and at ultimate buildout will cover 66 square miles. By 2042, Loveland’s population is estimated to hit 110,000 people, according to the same report. But, simultaneously, per-capita water consumption has been steadily falling nationwide over the past 20 years due to efficient fixtures and conservation initiatives, Bernosky said. Additionally, the introduction of metered water rates has played a role in reducing use compared to the previous flat monthly fee, Greene said. Luckily for the city, one variable is already locked in: The city of Loveland’s water district is surrounded on all sides by other districts, so the area it will serve is finite. Nevertheless, Bernosky said it is very difficult to take these trends and accurately predict the city’s water needs. There are a lot of pitfalls in forecasting the future as development patterns shift or decline, technology advances, natural events like droughts take place, economic factors play in and unexpected events occur, he said. ComSciCon-Rocky Mountain West 2018 will be held October 20-21, 2018 in Fort Collins, CO at Colorado State University. The application deadline is August 10th. Questions may be directed to rmwest@comscicon.org.